After two quiet typhoon seasons, weather forecasters are bracing for a more active time ahead. Typhoon Kong-rey has already gone into the history books, despite the fact the official typhoon season doesn’t begin until June 1st. Kong-rey skirted Guam by a mere 100 miles April 2nd, dumping nearly two inches of rain on the island while packing 30mph winds. The traditional typhoon season runs through November 30th, although Mother Nature is known for ignoring human defined periods. Military and Japan Meteorological Agency forecasters are keeping a wary eye on the charts as they anticipate a more active six months than experienced during 2005 and 2006 seasons. While 75 typhoons were spawned over the past three years, only one actually hit Okinawa in 2005, and two lashed the southern prefecture last year. A record-tying 32 typhoons formed in 2004, with 13 venting their furies on Okinawa. The islands, which operate on a Tropical Cyclone Conditions of Readiness (TCCOR) through the end of November, are making preparations for an active season by issuing warnings and reminders to residents on how to be prepared. By any name, typhoons are something to be reckoned with. In Greek, it means whirlwind. In Arabic it’s deluge. Mandarin Chinese defines it as a great wind. 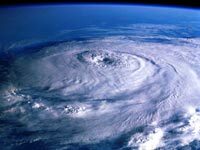 The name typhoon evolved from southern Europe, across Arabia to India, where in 1588 it was first cast in English. It was spawned from a severe storm that ravaged India, leading officials to merge the Greek and Chinese ideas into the word that today often means severe death and destruction in Asia. TCCOR 4: Okinawa remains in this state throughout the season. Destructive winds of 58 mph or greater are possible within 72 hours. Personal items kept outdoors, such as barbeque grills and children’s toys, hould be brought inside.